Sonny Boy II "Bye Bye Bird"
Sonny Boy Williamson was, in many ways, the ultimate blues legend. By the time of his death in 1965, he had been around long enough to have played with Robert Johnson at the start of his career and Eric Clapton, Jimmy Page, and Robbie Robertson at the end of it. In between, he drank a lot of whiskey hoboed around the country, had a successful radio show for 15 years, toured Europe to great acclaim, and simply wrote, played and' sang some of the greatest blues ever etched into black phonograph records. His delivery was sly, evil and world-weary, while his harp playing was full of short, rhythmic bursts one minute and powerful, impassioned blowing the next. His songs were chock-full of mordant wit, with largely autobiographical lyrics that hold up to the scrutiny of the printed page. Though he took his namesake from another well-known harmonica player, no one really sounded like him. 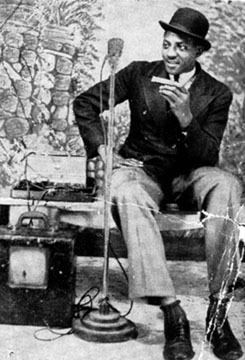 A moody, bitter, and suspicious man, no one wove such a confusing web of misinformation as Sonny Boy Williamson II. Even his birth date (either 1897 or 1909) and real name (Aleck or Alex or Willie "Rice"-which may or may not be a nickname-Miller or Ford) cannot be verified with absolute certainty. Of his childhood days in Mississippi absolutely nothing is known. What is known is that by the mid '30s, he was traveling the Delta working under the alias of Little Boy Blue. With blues legends like Robert Johnson, Robert Nighthawk, Robert Jr. Lockwood, and Elmore James as interchangeable playing partners, he worked the juke joints, fish fries, country suppers, and ball games of the era. By the early '40s, he was the star of KFFA`s King Biscuit Time, the first live blues radio show to hit the American airwaves. 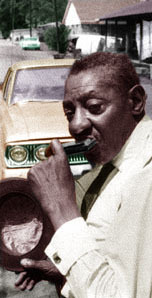 As one of the major ruses to occur in blues history, his sponsor-the Interstate Grocery Company-felt they could push more sacks of their King Biscuit Flour with Miller posing as Chicago harmonica star John Lee "Sonny Boy" Williamson. In today's everybody-knows-everything video age, it's hard to think that such an idea would work much less prosper. After all, the real Sonny Boy was a national recording star, and Millers vocal and harmonica style was in no way derivative of him. But Williamson had no desire to tour in the South, so prosper it did, and when John Lee was murdered in Chicago, Miller became-in his own words-"the original Sonny Boy." 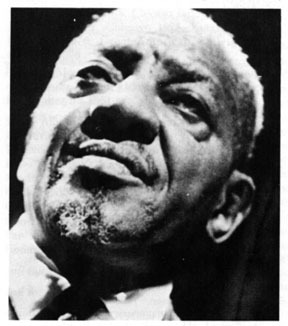 Among his fellow musicians, he was usually still referred to as Rice Miller, but to the rest of the world he did, indeed, become the Sonny Boy Williamson. The show was an immediate hit, prompting IGC to introduce Sonny Boy Corn Meal, complete with a likeness of Williamson on the front of the package. With all this local success, however, Sonny Boy was not particularly anxious to record. Though he often claimed in his twilight years that he had recorded in the '30s, no evidence of that appears to have existed. Lillian McMurray, the owner of Trumpet Records in Jackson, MS, had literally tracked him down to a boarding house in nearby Belzoni and enticed him to record for her. The music Sonny Boy made for her between 1951 to 1954 show him in peak form, his vocal, instrumental, and songwriting skills honed to perfection. Williamson struck paydirt on his first Trumpet release, "Eyesight to the Blind," and though the later production on his Chess records would make the Trumpet sides seem woefully underrecorded by comparison, they nonetheless stand today as classic performances, capturing juke-joint music in one of its finest hours. Another major contribution to the history of the blues occurred when Sonny Boy brought King Biscuit Time guest star Elmore James into the studio for a session. 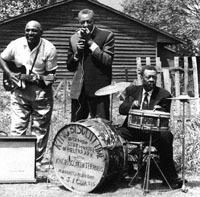 With Williamson blowing harp, a drummer keeping time, and the tape machine running surreptitiously, Elmore recorded the first version of what would become his signature tune, Robert Johnson's "Dust My Broom' " By this time Sonny Boy had divorced his first wife (who also happened to be Howlin' Wolf's sister) and married Mattie Gordon. This would prove to be the longest and most enduring relationship of his life outside of music, with Mattie putting up with the man's rambling ways, and living a life of general rootlessness in the bargain. On two different occasions Sonny Boy moved to Detroit, taking up residence in the Baby Boy Warren band for brief periods, and contributed earth-shattering solos on Warren sides for Blue Lake and Excello in 1954. By early 1955, after leasing a single to Johnny Vincent's Ace label, McMurray had sold Williamson's contract to Buster Williams in Memphis, who in turn sold it to Leonard Chess in Chicago. All the pieces were finally tumbling into place, and Sonny Boy finally had a reason to take up permanent residence north of the Mason-Dixon line; he now was officially a Chess recording artist. His first session for Chess took place on August 12, 1955, and the single pulled from it, "Don't Start Me to Talkin'," started doing brisk business on the R&B charts. By his second session for the label, he was reunited with longtime musical partner Robert Jr. Lockwood. Lockwood-who had been one of the original King Biscuit Boys-had become de facto house guitarist for Chess, as well as moonlighting for other Chicago labels. With Lockwood's combination of Robert Johnson rhythms and jazz chord embellishments, Williamson's harp and parched vocals sounded fresher than ever and Lockwood's contributions to the success of Sonny Boys Chess recordings cannot be overestimated. For a national recording artist, Williamson had a remarkable penchant for pulling a disappearing act for months at a time. Sometimes, when Chicago bookings got too lean, he would head back to Arkansas, fronting the King Biscuit radio show for brief periods. But in 1963 he was headed to Europe for the first time, as part of the American Folk Blues Festival. The folk music boom was in full swing and Europeans were bringing over blues artists, both in and past their prime, to face wildly appreciative White audiences for the first time. Sonny Boy unleashed his bag of tricks and stole the show every night. He loved Europe and stayed behind in Britain when the tour headed home. He started working the teenage beat club circuit, touring and recording with the Yardbirds and Eric Burdon's band, whom he always referred to as 'de Mammimals'. On the folk blues tours, Sonny Boy would be very dignified and laidback. But in the beat club setting, with young, White bands playing on eleven behind him he'd pull out every juke-joint trick he used with the King Biscuit Entertainers and drive the kids nuts. "Help Me" became a surprise hit in Britain and across Europe. Now in his mid-60s (or possibly older), Williamson was truly appreciative of all the attention, and contemplated moving to Europe permanently. But after getting a harlequin, two-tone, city gentleman's suit (complete with bowler hat, rolled umbrella and attache case full of harmonicas) made up for himself, he headed back to the States-and the Chess studios-for some final sessions. When he returned to England in 1964, it was as a conquering hero. One of his final recordings, with Jimmy Page on guitar, was entitled "I'm Trying to Make London My Home"
In 1965, he headed home, back to Mississippi one last time, and took over the King Biscuit show again. Still wearing his custom-made suit he regaled the locals with stories of his travels across Europe. Some were impressed, others who had known him for years felt he could have just as well substituted the name "Mars" for Europe in explaining his exploits, so used were they to Sonny Boys tall tales. But after hoboing his way around the United States for thirty-odd years, and playing to appreciative audiences throughout Europe, Sonny Boy had a perfectly good reason for returning to the Delta; he had come home to die He would enlist the help of old friends like Houston Stackhouse and Peck Curtis to take him around to all the back-road spots he had seen as a boy, sometimes paying his respects to old friends other days just whiling away an afternoon on the banks of a river fishing.